With the development of smartphones, many apps and games have been developed too. All of us like playing games on our phones daily for fun and all of us love the celebration of Halloween and the awesome Halloween pumpkins. For that reason, we searched and we discovered one game that offers one highly addictive Halloween pumpkin gameplay – Halloween Pumpkin Rescue. Let's talk about what the game is about. What is Halloween Pumpkin Rescue all about? 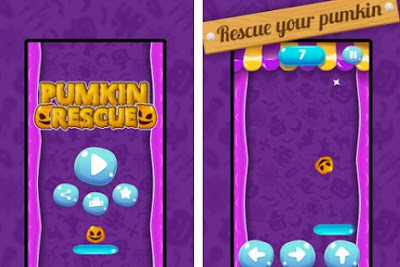 The Halloween Pumpkin Rescue is a highly addictive and entertaining arcade game, developed for android users and created for Halloween fans. On this Halloween arcade game, players are getting amazing and high-quality graphics with colorful design as cool background sounds every time they play the game. This game is also highly challenging, offering the players to challenge the gravity for saving the pumpkins and enjoying the greatest Halloween party night. The game offers more than a fun gameplay, it also challenges the player to rescue all the pumpkins and save Halloween. Every player of this arcade has rescue the pumpkins before they fall off and reach the ground. With the arrows for left and right, and the up arrow, players can move the board to catch all the pumpkins. The players must go up the tunnel and save infinite number of pumpkins that are falling off. Every player must react as fast as he can to catch all the pumpkins. The game is offering an option for pausing anytime the player wants to. Every player can save the Halloween pumpkins and get to enjoy the most exciting Halloween experience ever.